Something to consider about moving air is that the velocity is not uniform at different height above the ground. friction (drag) from the ground and structures on the ground cause the air close to the ground to be moving much slower that higher up. This velocity differential is important in designing horizontal axis wind turbines as the strain on the blades will be different at different heights and if not managed correctly can cause damage or destruction of the turbine blades internal bearings and gears. 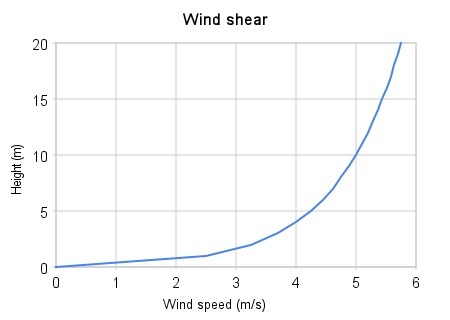 Wind shear chart: consider a horizontal axis turbine in the charted wind shear environment. Axis height at 2.5 meters above ground level and blades 2 meters long. 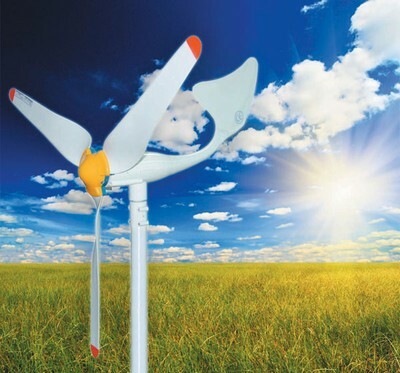 A blade as it rotates closest to the ground will exposed to a wind speed of only 1 m/s and as it reaches its highest point will be exposed to 4 m/s wind speed. This fluctuation will cause the blade to flex and be placed under considerable repeated strain which will cause failure. Even before this failure occurs the turbine will be subjected to torque fluctuation as the turbine speeds up and slows down repeatedly placing strain on other parts.Remember that in the equation for determining the energy of the wind turbine, the relationship varies with air velocity cubed (v³). This means 1 m/s wind speed vs 4 m/s becomes 1³ : 4³ or 1 : 64 difference in energy from the top to the bottom of the swept path of the blades. This is a typical chart for wind shear though wind shear will vary depending on whether the ground is flat/sloped/undulating and what is on the ground creating drag, buildings, shrubs, trees, crops. I you are serious or making/installing a larger turbine you will need to create a wind shear chart for your proposed location. 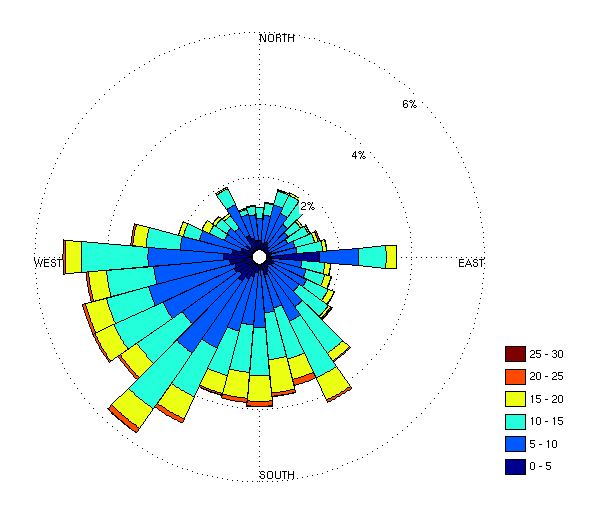 Wind strength varies from different directions, and a wind rose chart will describe this. In an ideal situation for a large turbine you have a large flat field. In a less ideal situation you may a a hill or treeline in close to the proposed turbine site. If this obstruction is not in a direction toward the prevailing winds indicated it is not so much of a problem, although structures in proximity to a turbine can cause turbulence which may cause similar problems to wind shear. This matters more for a horizontal axis turbine as they must move to face the wind and blades are more susceptible to damage by wind shear and turbulence. The wind rose will probably give you a good idea about what the prevailing winds are for you location. If you can’t do an extensive study ask a long time local resident and they should give you a pretty good idea. In some conditions the wind may change direction repeatedly. This is quite common where there is a lot of turbulence from structures, low speed wind or stormy conditions. A horizontal axis turbine finds these conditions challenging as it has to continually alter its direction to face the wind. The larger commercial turbines lack the rudder of smaller turbines and instead use pressure sensing electronics and motors to adjust the heading direction of the turbine. Another factor to c0nsider in this changing of heading direction is the angular momentum of the turbine assembly is going to resist a change in heading this is another strain on the entire structure. to understand angular momentum get a bicycle wheel spinning by holding each axle tip in each of you hands and them try to move the wheel. The weird twisting forces you feel is the wheels angular momentum resisting change, just the same as a rolling ball resists changes to it’s direction of travel. Where there is shifting wing a horizontal axis turbine is not preferred. Gusty wind will cause a similar phenomenon to wind shear the unpredictable repeated warping and flexing of turbine blades. Very high speed winds will cause the turbine to oscillate in dangerous way and will cause damage and possible catastrophic destruction of a turbine. A resonant frequency may be activate in a turbine at certain wind speeds and develop a fatal oscillation. For this this reason large turbines have emergency brakes to slow down the rotation speed of a turbine to protect it of damage or destruction. The destruction of a turbine due to over speed or resonant oscillation is rather dramatic to watch, but as most turbines are in remote areas and have no on site staff, it is rare for there to be injuries or fatalities. If a turbine was close to a residential area and catastrophically failed, there would be significant chance of injury or death from falling/flying pieces. horizontal axis wind turbine in high wind in 2008, due to failure of braking mechanism, leading to catastrophic over speed.